Star Wars : Knights Of The Old Republic is a role-playing game released in 2004 by Bioware for the Original Xbox and was later released on the Windows PC, Mac OS and mobile devices. I had a PlayStation 1 and 2 but this was the game that made me buy an Xbox and I haven't looked back. Knights Of The Old Republic is set 4,000 years before the Star Wars depicted in the movies. The creators of this game were smart to do it because it gives you all the toys from the Star Wars universe without all the baggage. 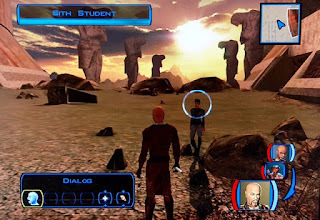 If you set this game during the rebellion era the only two Sith would be Darth Vader and the Emperor. Instead setting this game way into the past allows them to do what they want. To game is filled with things that are close to what are depicted in the original movies like your ship the Ebon Hawk is a pretty good proxy for the Millennium Falcon. You find a wookie with a life debt, a Yoda alien Jedi Master, Darth this and Darth that, light sabers everywhere and bad guy soldiers that can step right in for Imperial Stormtroopers. The the rebellion you could do what this game does, we know what Yoda did while Luke was growing up. We know there are only two Sith, if you were in control of the Falcon you know where it was during the movies. Unless you last name was Skywalker you aren't going to have a light saber to fight with. Making the game in the past gives you all the things that makes the universe Star Wars but still allow them to have a unique story that can be as epic as Luke Skywalker. This story would never work in the movie universe. Without giving away any big spoilers the story starts after a war against the Mandolorians when two fallen Jedi turn to the dark side and attack the Republic with their Sith army. Your character is a republic soldier on a star ship under attack. You need to get to safety and find a Jedi that was on the ship with you. From there you meet some people, some who decide to go adventure with you, and get yourself a ship to travel from planet to planet. You discover that the Sith have found something, possibly a powerful weapon, and you need to find out what it is and how to stop them from using it to destroy the Republic. As the game gets going you find out that you are sensitive to the force and it's decided that despite being an adult you would be trained in the ways of the Jedi. As you get closer to the end of the story the game hits you with a big twist, one I honestly did not see coming and really helps draw you into the story. As this game is by Bioware who made the Mass Effect games you have the option to be good or bad. When a situation comes up you are giving the option to act in a noble Jedi way or an evil Sith way. This does matter because certain powers and items can only be used by one side or the other. Also people will treat you differently depending upon your alignment. When the game first came out I played the game as a noble Jedi, ready to help anyone in trouble. This time I played it very evil and although the main focus of the story is the same there are changes here and their that are different enough to make a second play through worth it. One of your companions is a Twi'lek named Mission who is followed around by a wookie named Zaabar. Well Zaalbar entered into a life debt with me and when I officially pledged my allegiance to the Sith most of my companions didn't have a problem with it but Mission did. Zaalbar also wasn't happy about it but said he had to stay with me whatever I did. Mission said that I would have to kill her but I told Zaalbar to do it instead. Of course he says that he cannot do that but I use the force to make him do it. I know it's a pretty terrible thing to do but I was laughing the whole time, I didn't think the game would take that turn. Sometimes it can be fun to play in the complete opposite way that you would normally play. The game has some new planets to explore and some familiar from the movies. It's a good balance and the places already depicted are different areas then already shown. In A New Hope you hear about Anchorhead but never see it. In this game you'll get to explore the city which is cool because you get to go to Tatooine but it's all new. Ersatz Millennium Falcon blasting its way out of Tatooine. 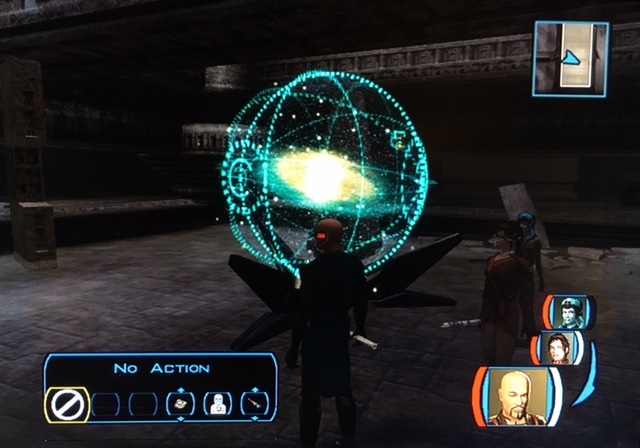 The game engine that this game uses is based upon the Star Wars RPG by Wizards Of The Coast. This was the first RPG that I ever played so I knew pretty well how to get the most of what I wanted. As far as it goes this game is pretty up front with the fact that you are using the pen and paper rules which games usually try to hide from you. It would be simple to take a character from one format and introduce them to the other. There are a total of nine companions that you'll come across. In Mass Effect it's possible that some of them won't join you for one reason or another. In this game they all joined up with me. I don't know if they would regardless of what I did or if I was lucky. Besides Mission and Zaalbar you also have join you a male Republic soldier named Carth, a female Jedi named Bastila, a Mandalorian man named Canderous, a female Jedi who turned to the dark side but is now back with the light named Juhani, a "Jedi" man named Jolee and last but not lease an assassin droid named HK-47. 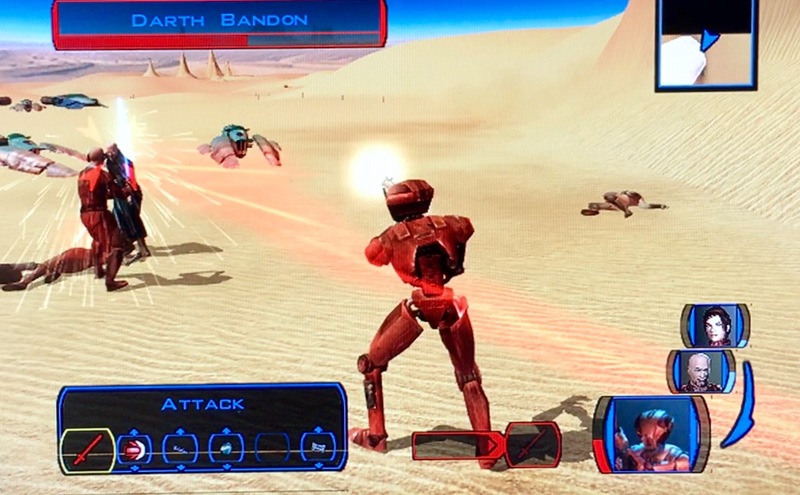 HK-47 was the breakout star of this game due to his hilarious behavior and ended up in the sequel to this game as well as the Star Wars Miniatures Game, and Star Wars Galaxies (the MMORPG) among other things. HK-47 opening up a can on a "Darth". The game allows you to have no more than two of you companions to go with you and on a few of the worlds you'll need to take a certain character an example being bringing Zaalbar with you to the wookie home world Kashyyyk. Combat is handled real time but the game allows you to pause the game to set what each character will do. The system works pretty good as I had no problems. The game for the most part is pretty easy, although I did have some trouble at the end of the game. There are some puzzles in the game but I didn't have any trouble with them. To break up regular game play there are a few things in game that you can do. The biggest being Swoop Races. Most of the planets you travel to have races that you can take part in for some extra money to use to upgrade your equipment. These races are pretty easy and are short, most are around 30 seconds. The game also has a card game you can play called Pazaak. I won't go in to the rules but you can find someone on each planet that will play with you. Unlike poker you collect cards to make a deck with good cards costing a lot and are hard to find. I didn't partake in the game but it could be a fun little side mission trying to find all the cards you need for a killer deck. There are also a handful of star ship battles that you fight in like Han and Luke in A New Hope. Again I found these very easy but are a nice way to break up the regular game play. The worst part of the game for me was the space suit levels. There are a few and they aren't too long but you walk so slow in the suit. Every time I had to put one on I groaned a little bit. If you just walked a bit faster it would have been OK by me. This game is a Star Wars game so the music and sound effects are great. The graphics are very nice as well and look good enough to be an early Xbox 360 game. I was very impressed with this games presentation. On a side note I couldn't find the AV cord for my Original Xbox so I played this game off of my Xbox 360 as it's one of the games backwards compatible. I have to say I did have some problems with the emulation that I don't remember having when playing on a regular Xbox (one of the reasons I don't like emulation). Most were just annoying things like how the sound effects would just stop working or how some of the speech would have issues. It was still understandable it was just another annoyance. The biggest issue I had was that during battles the game would slow down to a crawl. It didn't happen all the time but it happened enough. The game did freeze once for me while this was happening but mostly would fix itself once the battle was over. Your character can understand many different languages so a lot of the aliens you talk to speak in their native tongue with subtitles on the bottom of the screen. I liked this because it felt more like Star Wars instead of every alien speaking English. The only issue with this is if you speak to the same species alien enough you'll hear the same words repeated. The alien language they speak is just gibberish that repeats. This game does suffer from a common issue in RPG games. You can talk everyone you see in the game but when you see the names above people like "Man" or "Jedi" you know you can skip them because they are going to have nothing important to say to you. As a matter of fact when you talk to these people instead of an actor doing the dialogue it's just a word bubble pops out for you to read. I know that adding actual dialogue for every single NPC in the game is a lot of work and this game could only have so much put into it being originally released on the Xbox. I've played a lot of video games over the years including RPGs and I have to say hands down this is my favorite RPG of all time, maybe my favorite game period. I love the story, the game play, the look of the game. It really make you feel like you're experiencing an adventure within the Star Wars universe. 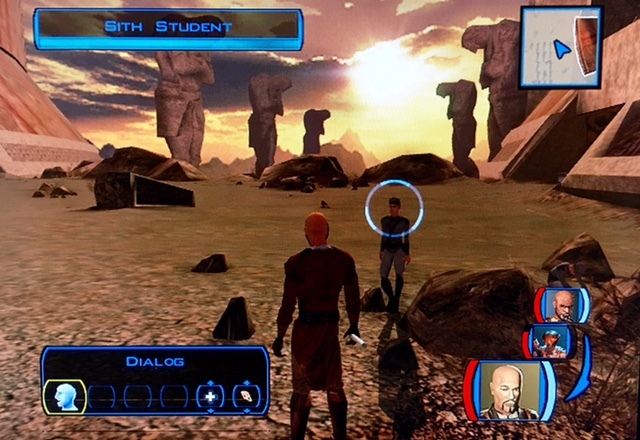 Now despite what I've already said you could make this game within the classic Star Wars universe. The story would just not be as epic as it is in this game. There are already a bunch of games like Shadows Of The Empire or Dark Forces that could be a guide for a new RPG. Those stories were interesting but small enough in scope that it didn't interfere with the main story from the movies. It's been over a decade since this game came out and except for its sequel there hasn't been a Star Wars RPG released (not counting MMORPG) and that is just a shame. In my humble opinion this game is a masterpiece. 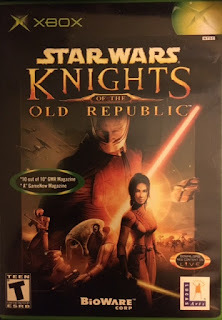 I give Knights Of The Old Republic a 10 out of 10!